Amid worsening humanitarian situation in South Sudan and the number of persons in need of assistance continues to grow, the United Nations migration agency today launched a $103.7 million appeal to sustain critical and life-saving aid programmes. “As civilians continue to bear the brunt of the crisis, experiencing violence and displacement, timely and effective humanitarian assistance is critical,” said William Barriga, the head of the UN International Organization for Migration (IOM) operations in the country, in a news release announcing the launch. “[We] remain committed to responding to these needs and reaching the most vulnerable, wherever they are,” he stressed. According to estimates, some 7 million people across the African nation are in need of humanitarian assistance, including 1.9 million internally displaced persons (IDPs). With full funding, the appeal aims to reach about one million displaced persons, their host communities as well as communities of potential returnees and migrants with assistance in 2018. Specific IOM programmes focus on providing aid and assistance as well as supporting transition, recovery and migration management initiatives. 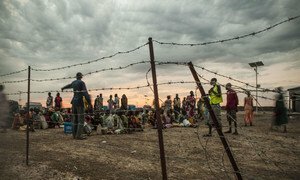 Additionally, in line with the broader 2018 Humanitarian Response Plan for South Sudan, the UN migration agency will also continue its multi-sector humanitarian responses in camp coordination and camp management, displacement tracking and monitoring, health, shelter and non-food items, mental and psychosocial support and water, sanitation and hygiene. Given the diverse nature of displacement and the dynamics of the crisis, IOM has adopted an integrated approach, where in migration management, recovery and stabilization efforts complement humanitarian interventions to build community resilience and reduce dependency on humanitarian aid. While the signing last month of a ceasefire accord among South Sudan’s warring parties is a great stride forward, it is just a first step toward peace and stability, the United Nations peacekeeping chief said Wednesday, warning that the 21 December deal has already been violated numerous times.